An incredibly exciting announcement. 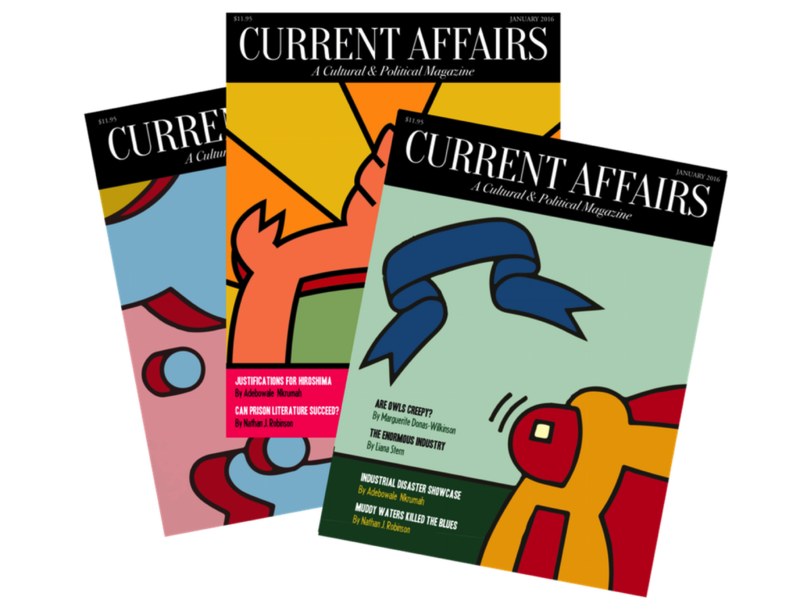 I’m now the editor of Current Affairs magazine, a new political periodical (in print!) It’s the project I’ve basically hoped for my entire life. I’m coordinating an incredible team of writers and editors, and we’re going to put out something that’s refreshing, hilarious, and bold. It’s going to focus on political commentary and cultural analysis, but it’s not going to be dreary and it definitely won’t be predictable. I’d love it if you’d consider subscribing. For 30 days, we’re holding a Kickstarter campaign in which we’re trying to raise $10,000. If we can do that, the first issue will be mailed out in January. It’s going to be beautiful, intelligent, and fun, I promise, and I just know you’ll be incredibly pleased with your subscription. Visit our Kickstarter page here to buy your subscription. Also, check out our website, currentaffairs.org. And you can follow us on Twitter or like us on Facebook. The Kickstarter has all kinds of additional information about the magazine, including a video of me sitting in front of a flamingo. I’m going to be merging this blog into the Current Affairs website soon, which is where all my writing will go. In the meantime, we need subscribers!